Home / Corporate Identity/Logo Design / DOWNLOAD a PMS colour guide. The pantone color chart is a subset of the pantone matching system which is a proprietary color space used in printing and many other industries. It is a standardized colour reproduction system and the whole essence is to standardize the colour so that different manufacturers can refer to the pantone system to ensure colours match without meeting each other. The pantone colour chart template has been widely adopted by designers, artist, printers and manufactures for accurately identifying, designing as well as communicating. The pantone colour chart is numerical and has precisely matched values for standard inks etc which ensures printers and designers always get the same results for print projects. 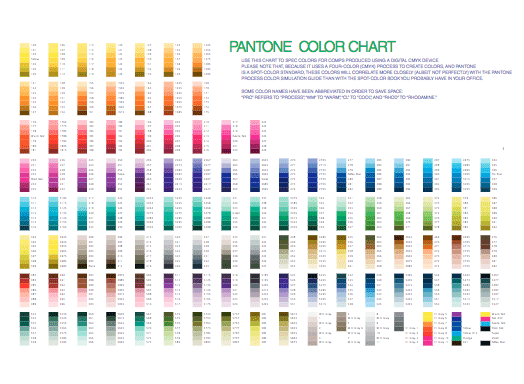 The pantone chart consists of over 595 pantone colors designed to give options when searching for a matching color. 1. It is important to consider putting your pantone colour chart on a board or matte so you can isolate the colour. Viewing the colour on any other colour will influence how you percieve it. 2. It is important to know basic color theory, definitions of value, hue and intensity. ← Cut to the chase… Let’s get up close and personal….